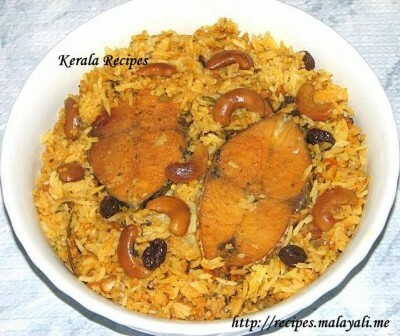 Here is another recipe for Fish Biriyani. I have not fried the fish fillets in this recipe. Instead, the fish is cooked in a spicy Biriyani Masala Gravy and then baked along with rice. I have used King Fish (Ney Meen) for this Biriyani. Even if the fish is not fried in oil, it will not break as long as you are using thick fish fillets. 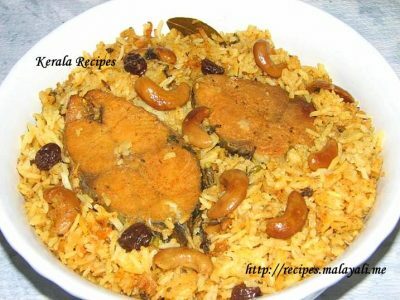 I tried making Fish Biriyani in a Pressure Cooker but it ended up being mushy. So, I prefer to bake my Biriyani in the oven. Baking Biriyani is always fool proof and the rice remains separate and fluffy. You can check out my previous recipe for simple Fish Biriyani here. Clean the king fish fillets thoroughly and soak it in water along with 1 tbsp lemon juice for around 10 minutes. This will remove any unwanted smell from the fish. Make a marinade using the above ingredients and rub it nicely on the fish pieces. Refrigerate it for 30 minutes. Boil the Basmati rice in atleast 6-8 cups of water with a little salt, 1/2 tsp biryani masala and 1 tsp oil, till each grain is separate and 3/4 cooked but not fully cooked. Add more water, if needed so that the rice doesn’t stick together. Drain excess water and keep the rice aside. Heat a big non stick pan or wok and add a combination of 3 tablespoons oil and ghee. Fry cashews and raisins until the cashews are lightly brown and the raisins become plump. Remove and keep aside. To the same pan, throw in fennel seeds, cinnamon, bay leaves and cloves. Saute for 2 minutes. Then add onions and saute till they are brown. This will take a while. Add the slit green chillies, curry leaves, chopped cilantro and mint leaves. Saute until the onions begin to brown. Reduce heat and add 1-2 tsp of biriyani masala powder, 1 tbsp fish masala powder, 1 tsp kashmiri chilly powder and 1/4 tsp turmeric and saute for a minute. Blend 1 cup of yogurt with little water and add it to the pan along with salt and mix well. Allow it to simmer for a while. Add the marinated fish fillets to the masala gravy and mix gently. Cover and cook the fish on medium heat for around 10-12 minutes. Keep the masala gravy aside. Meanwhile preheat oven to 350 degree F. Apply some melted ghee or oil on a baking dish. Layer it with the semi cooked rice and the fish masala gravy alternatively. Sprinkle lemon juice in between. Cover the biriyani with an aluminuim foil and bake for 30 minutes. Garnish with fried cashews and raisins. It’s best to keep the biriyani for at least 4 hours before serving so that all flavors are absorbed. Mix the biriyani gently before serving. Serve the Fish Biriyani with Raitha, Pickle and Pappad. If you are in a hurry, you can use any good store bought biriyani masala powder which is readily available like Eastern Biriyani Masala. Generally, the ingredients of such ready made masala powders would be the following: Coriander, Bay Leaf, Chilly, Black Pepper, Turmeric, Aniseed, Cinnamon, Cardamom, Salt, Cloves, Nutmeg, Cumin. You can make Biriyani Maslaa at home. Here is the recipe for home made ground Biryani masala. If you are using thin pieces of fish, I recommend frying the fish before adding it to the gravy. This will prevent the fish from breaking. If you do not have a Conventional Oven at home, then you can layer the Biryani and cook it on stove top. Take a heavy bottomed pan (preferably nonstick) and layer it with Rice, Fish and Gravy as mentioned above. Cover the pan with a tight lid so that steam does not escape. If the lid is not tight, you can seal it with Chappathi dough. Cook the Biryani on very low heat for around 20 minutes. To prevent the Biryani from burning at the bottom most layer, it is better to cook it over indirect heat. Immerse this heavy bottomed pan in a bigger pan filled with little water and cook it on low heat for 20-30 minutes approx. You can also place the heavy-bottomed pan over a Tava or Frying pan instead of keeping it directly on stove-top and then allow it to cook over indirect heat. Made fish biryani using this recipe the first time in my life.. Liked by all in the family. My wife was not too sure but it turned out to be a hit. We in Karachi Pakistan Cook fish biryani differently. Thank you Malayali.me. Great recipe. Went by the book and it turned out delicious.